Transport Minister Khaw Boon Wan said in Parliament that there will not be a public inquiry into the flooding of MRT tunnels. He added that steps have been taken to improve the anti-flooding systems and prevent recurrence of the incident. The design of the Bishan water pump system is being improved, the pay of top management will be reviewed and experts have been roped in from Taipei Metro as part of efforts to prevent the Oct 7 MRT tunnel flooding and similar incidents from happening again. Transport Minister Khaw Boon Wan yesterday took Parliament through the events of Oct 7, which he described repeatedly as "sad" and "embarrassing". In a two-hour debate, during which SMRT chief executive Desmond Kuek and several of his senior colleagues sat grimly in the Parliament gallery, Mr Khaw also outlined an action plan to prevent a recurrence of the flooding. First, all float switches controlling pumps in the storm water sump pit have been replaced with heavier-duty models which can handle "water with more sediments". Parallel float switches have also been installed so that no one switch determines the activation of the pumps. On Oct 7, a malfunctioning override switch prevented all three pumps from kicking in. A new radar sensor system has been added to independently monitor water levels in the sump pit. These measures came in response to the tunnel flooding which shut down a large stretch of the North-South Line for about 20 hours and affected 250,000 commuters on Oct 7 and 8. Next, Mr Khaw revealed the SMRT board will "review the remuneration of its senior management, from the CEO through the relevant chain of command". "This is as it should be," he said, adding that new SMRT chairman Seah Moon Ming - whom Mr Khaw recommended for the post - told him of the board's intent. It is the responsibility of management to set the right culture of professionalism and excellence. It begins from the top. And if there is poor culture, the CEO is responsible. You set the corporate culture. TRANSPORT MINISTER KHAW BOON WAN, in an oblique reference to the SMRT chief executive's statement that there are "deep-seated cultural issues" within SMRT. "It is the responsibility of management to set the right culture of professionalism and excellence. It begins from the top. And if there is poor culture, the CEO is responsible," he said, in an oblique reference to Mr Kuek's statement that there were "deep-seated cultural issues" within his company. SMRT vice-president Ng Tek Poo, who was in charge of the team responsible for upkeeping the anti-flood system, has been suspended. Six other managers were also suspended in relation to the maintenance lapses in the network's anti-flood system. 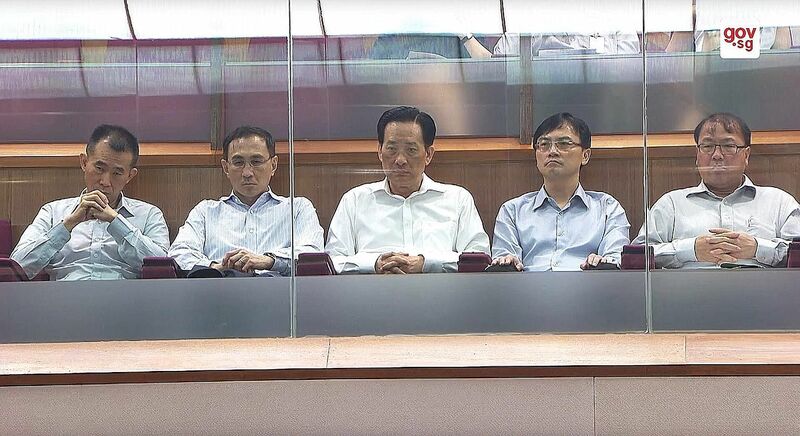 They included another vice-president who was Mr Ng's predecessor, a chief engineer and a deputy director. SMRT has also roped in experts from Taipei Metro to conduct an "independent review of its operations, to flush out any gaps, and recommend improvements in the areas of system management, engineering and maintenance". Mr Khaw revealed that ST Kinetics chief technology officer Richard Kwok will head SMRT's audit team from Dec 18. Mr Kwok's team will report to the SMRT board, and he will also lead a Joint Readiness Inspection team which will report to the Land Transport Authority (LTA) and SMRT "joint board technical committee". "The tighter audit system will help to identify any deficiencies so that they can be addressed early before faults occur," Mr Khaw said. Fifteen MPs questioned Mr Khaw after his statement, seeking more clarity on issues ranging from audits on SMRT to its culture. In response to a question filed by Chua Chu Kang GRC MP Zaqy Mohamad, Mr Khaw said the incident did not merit a public inquiry. "While investigations by LTA will take a few more weeks to complete, the facts of the Oct 7 incident are not complicated, and the cause of the incident is clear," Mr Khaw said. "My ministry will therefore not be convening a committee of inquiry."